Everything you need in your fall kitchen! This multipurpose traveling container is the most versatile item you’ll use all year! Anything you choose to transport will arrive safe and fresh. 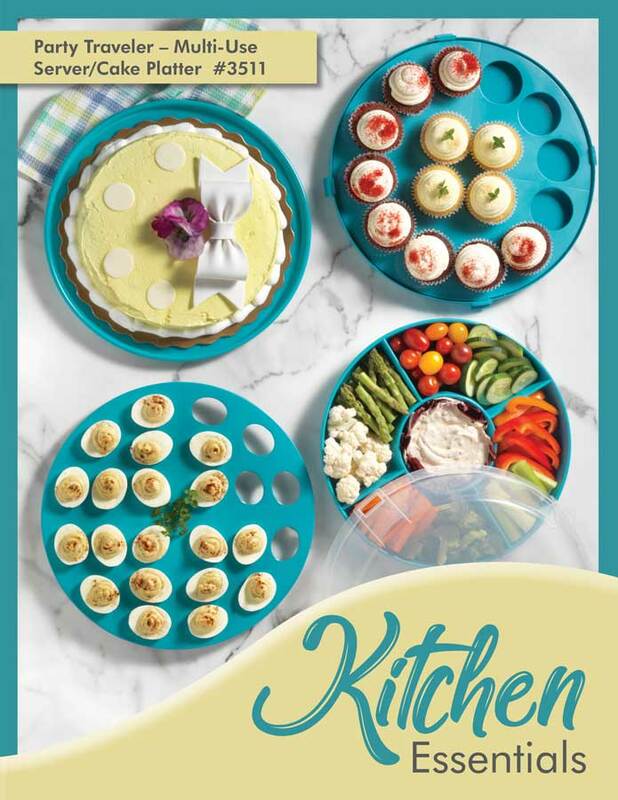 From your deviled eggs and famous veggie dip to your baked masterpieces! Lid locks down and the super convenient carrying handle means you’re ready to go! High-quality nylon blade makes it easy to chop foods for cooking and seasoning evenly. Safe for nonstick cookware. Dishwasher safe. 11 .” L.
Crush your garlic cloves without the mess with this handy garlic crusher. Non stick nylon spatula with beveled edges for easy lifting. Stainless steel wire head. Dishwasher safe on top shelf. $12”L. Wow your guests with the perfect pie, then serve the perfect slice like a pro! Our adjustable silicone shield with prevent your crust from burning and the stainless steel lifter will ensure a beautiful slice on each plate. Before baking your next batch of cookies or sticky buns, cover the baking sheet with this reusable, flexible nonstick liner. Provides an excellent surface for rolling out pastry dough. Rolls up for compact storage. Heat resistance up to 440 degrees. 16” x 11 .”. It measures up to 8 cups while also acting as a mixing bowl, storage bowl and has a pour spout making that next baking project a breeze. 9”W x 6” H.
This spatula beats the rest! Whether it’s tater tots or cookies, you’ll love the time saving ease of removing several at a time, fresh from the oven. Sturdy metal with silicone coating. The cookie dough scoop is the perfect tool for uniform measuring of cookie dough. Simply scoop and press the silicon “button” for release. Makes the perfect batch of cookies with ease! Measures 6 ó” long, 1 ó” diameter scoop. Whip, blend, chill, serve, store... these stainless steel mixing bowls make these the most versatile and frequently-used bowls in the kitchen. Stainless steel with plastic lids. Sizes: 8 oz., 12 oz., 16 oz., 32 oz., and 44 oz. Bowls nest for easy storage. Dishwasher safe. 4", 4-3/4", 5-1/2", 6-3/8", 7-1/8".